Need to get rid of Carpenter Ants? Carpenter ants get into your home through a variety of ways—telephone wires, cracks in the foundation, attic vents, and plumbing lines—then make your home theirs. 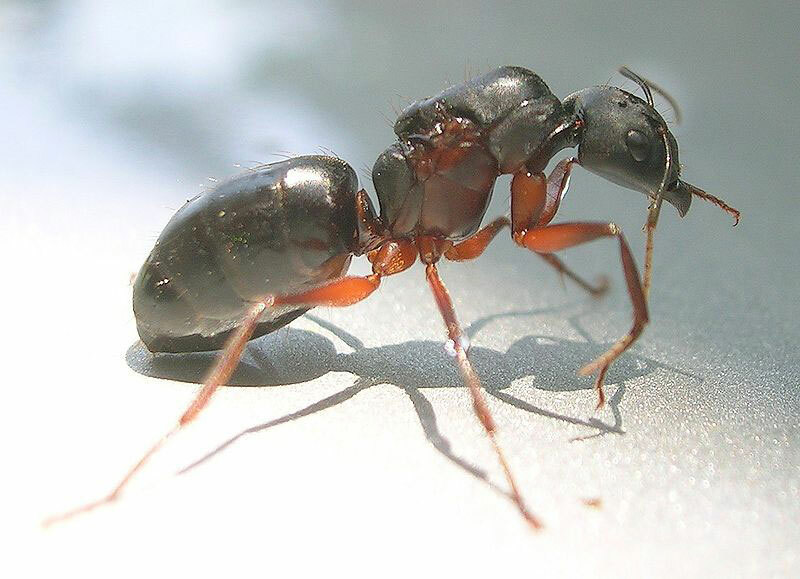 Carpenter ants sound a lot like termites, right? Termites eat wood – carpenter ants just damage it in order to make their nests. In terms of diet, wood doesn’t do it for ants. They keep a steady balance of meats and sweets – mostly eating other insects, honeydew, and syrups. Carpenter ants nest in moist or rotted wood, and they tunnel great lengths to get there (on the plus side – an infestation lets you know that you have a moisture problem in your house!). In route to the nest, they may chew up many parts of the home’s wooden structure to get where they need to be. An infestation is no need to panic; it can take years for damage to become significant. However, Carpenter Ants are considered structural pests, thus they should not be ignored. It still needs to be treated, though. For one, carpenter ants form satellite nests, and the problem can be much harder to treat over time. Then, if you disturb them, they can bite you! These bites can be painful – their mandibles can break the skin, and then they make things worse by spraying a chemical of formic acid into the wound. It’s best to check at night. Carpenter ants typically nest outside—like hollowed out tree logs—and enter the home between 10:00pm and 2:00am to forage for food and water. You’ll see a long line, which you may be able to trace back and see how they’re entering the home. A common area to follow the ants is along the foundation stem wall. When that’s identified, simply seal the entryway. Delete this orange section. To handle a larger carpenter ant infestation, you need to use residual insecticides and void injections of insecticide. This can require people & pets leaving the home for a few hours. An exterminator is useful because we have the proper equipment to reach the areas where carpenter ants like to live, like the wall voids of your home. If you have a carpenter ant problem, call the Bug Man at (503) 284-6269 to take care of it.